A program to help Indigenous businesses grow and succeed will be launched in Albury on Wednesday 5 April by CSU and the NSW Government's Boosting Business Innovation Program. A program to help Indigenous businesses grow and succeed will be launched in Albury on Wednesday 5 April by Charles Sturt University (CSU) in conjunction with the NSW Government and its Boosting Business Innovation Program. The Walan Mayinygu Indigenous Entrepreneurship Pop Up Hub, developed by CSU Associate Professor Michelle Evans, aims to further nurture Indigenous businesses across NSW in 2017. "Walan Mayinygu, which means 'strong for people' in Wiradjuri, is about strengthening Indigenous entrepreneurship and business nous at the regional level in grassroots firms across NSW," explained Professor Evans from the University's Faculty of Business, Justice and Behavioural Sciences. "We are hoping to engage and inspire Indigenous business people and those thinking of going into business by offering workshops, master classes, opportunities to present and pitch their business ideas, trade shows and networking events, with the help of established Indigenous entrepreneurs. "We aim to amplify regional dialogues on Indigenous entrepreneurship and encourage strong, resilient businesses and business owners." 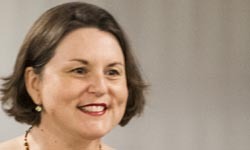 Professor Evans is well placed to lead this program, having co-founded the Melbourne Business School's MURRA Indigenous Business Master Class Program, a business leadership development program for established Indigenous entrepreneurs. As part of the Walan Mayinygu program, Pop Up Hubs will visit communities for one week at a time in Dubbo starting on Monday 28 August, Albury from Monday 9 October, and Port Macquarie on Monday 5 March 2018. A date for Lismore will be advised after the recent floods. "The roaming Pop Ups will overcome geographical isolation to provide productive spaces for individuals and communities to generate their own business ideas and ultimately build momentum for the Indigenous Australian entrepreneurial sector," Professor Evans said. During each Pop Up visit, entrepreneurial education and practical workshops will be delivered by appropriate experts and successful Indigenous entrepreneurs, including alumni of the MURRA Indigenous business master class program. In addition, the Pop Up Hubs will improve access by participants to government departments, private firms and not-for-profit organisations to develop business relations; bring designers, developers and entrepreneurs together in 'tech hackathons' to encourage networking and collaborative work; provide opportunities to work with customers to hone sales skills; and provide co-working spaces. Once the Pop Up moves on, participants can continue to engage with the program through the Walan Mayinygu website. "For Indigenous communities, economic empowerment through job creation and business development and innovation is recognised as a key factor in closing the inequality gap and improving health outcomes and quality of life for Indigenous Australians," Professor Evans said. "This Indigenous entrepreneurial wave needs nourishment through business education, business connections and business incubation," Professor Evans concluded. For interviews on the program with CSU Associate Professor Michelle Evans, in Albury-Wodonga, contact CSU Media. For further information on the Boosting Business Innovation Program, contact the Department of Industry on 0437 504 752 or send an email. The Walan Mayinygu Indigenous Entrepreneurship Pop Up Hub program will be officially launched on Wednesday 5 April in the Retro Café, off QE2 Square, Dean St, Albury, between 11am and 12 noon. For interviews at the event, contact Wes Ward from CSU Media on mobile 0417 125 795, or Mayrah Sonter from 33 Creative on mobile 0405 834 016. Walan Mayinygu is a Charles Sturt University program, proudly supported by the NSW Department of Industry through the Boosting Business Innovation Program. * Hunter, B. (2014). Indigenous employment and businesses: Whose business is it to employ Indigenous workers? Canberra, Australian National University.